Whether your cake is for a wedding, birthday or other celebration the last thing you want is to find you don’t have enough cake to go round to all of your guests! The guide below gives you approximate servings for round and square cakes. If you are unsure of the size of the portions (or cakes) you would like, we are more than happy to help suggest the best size for your event. Sponge cakes are usually cut into dessert size portions about 2 x 1 x 4" (but can be cut into the smaller or larger portions if preferred). Rich fruit cakes are traditionally cut into coffee size portions measuring 1 x 1 x 4". This means a sponge cake cuts into fewer portions than a similar sized fruit cake. 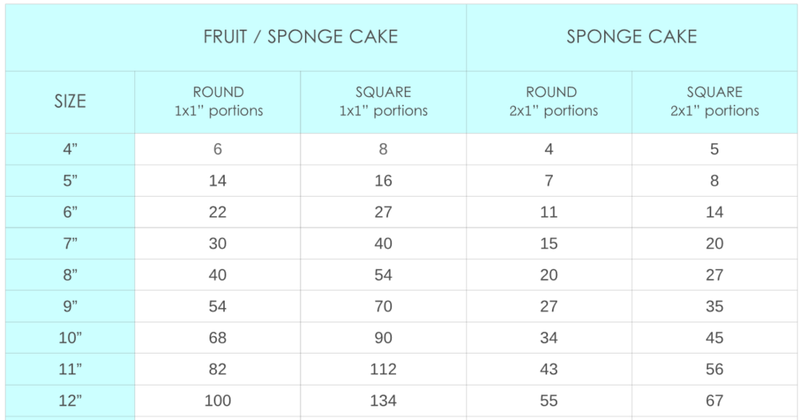 The table below gives a rough guide to the number of portions you can cut from round or square cakes of various sizes. The number of portions given on the chart is only intended as a guide as actual quantities may vary depending on the person cutting your cake. You will be provided with a cutting guide when your cake is delivered to help you to get the number of servings needed.